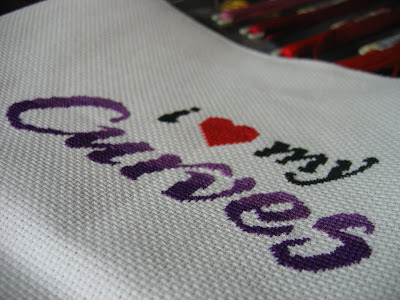 Last night I made all the final tweeks on my Curves chart that I finished stitching a few nights ago. It's looking really good - a pretty quick and easy project. The ladies at Mall Day should love it. I'll get it posted as a download soon so you can stitch along! I don't see too much working out either. They're all a bunch of chatty kathyies. I go right after work - everyday at 4:45. Today is the day of truth... we'll see if they liked it in about 45 minutes! So what was the jurisdiction? I think they should at least give you a discount on next year's membership - or maybe some free publicity in the Curves magazine! I bet if you wrote up an article with pictures they would publish it! You caught me in my morning blog surveillance! Eh, the Curves charts didn't have many takers I'm sorry to say. I seem to have gotten a lot of play on the FileQube download though so I'm happy... I guess. Even in this day of age of handmade I think most people still want the finished product. Oh well.